i thought it would be fun to have regular top 10's on my blog. 1. Make your own christmas tree ornament. Very easy and fun! 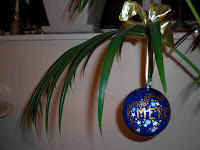 Get a plain Xmas tree ball from your favourite artsy-craftsy-shop (like this one here) and paint it using any type of paint you like. I just recently painted one with acrylic paint and then put a layer of glossy varnish over it. In order to paint it without making a mess, rest the ball onto a glass, paint the top side and dry it with a hair dryer, then turn it around. A picture of the final product is above. 2. Make your own painted crockery. Sounds hard but it's not. There are shops (like this one in the UK) where they have unpainted crockery templates (bowls, mugs, plates, jewelery boxes, little figurines.. anything), as well as all the enamel paints you need. You just paint them there, they burn the crockery for you. Very nice! 3. 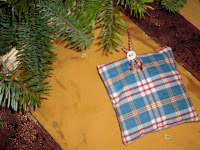 Make your own christmas stocking. Use all kinds of old material you have lying around, sew it together, done! 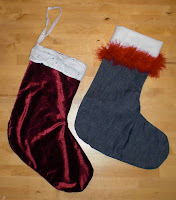 A picture of two stockings I made is below. 4. Make your own lavender pillow. My friend made the one on picture three, it's so nice! it now hangs in my wardrobe and makes my clothes smell nice. 5. Make your own candles. Collect old candles and melt them in a pot. Buy candlewick and place it in your shape/glass/baking tin of choice. Tie the top of the candlewick to a match/stick that you balance across the top. Then fill in the wax. I've made some just recently, see below. 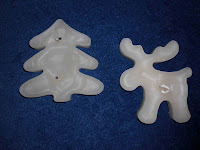 i guess i could have made them a bit nicer by putting some die into the wax... next time around! 6. Make your own pine-wreath. Buy pine twigs, tie them into a wreath with wire. Decorate with slices of dried orange, cinnamon sticks, ribbon, anything you like. It's much cheaper than bying the wreath and it's not too hard to make yourself. 7. Make your own mulled wine spice. Buy empty tea bags (here), fill them with coriander, nutmeg, cinnamon, cloves, cardamom and dried orange peel (half table spoons for a few litres of mulled wine) and wrap them nicely. your friends can then boil the teabag along with the red wine in a pot. yum! 8. Make stuff from salt-dough. Salt dough is great because it's so easy to make (two cups of flour to one cup of salt and one cup of water). Makes any shape you like that you can then either air-try or bake in the oven. Then paint. 9. Make your own cookery book. 10. Make your own Xmas CD. Kind of lame but also nice.